Introduced in 1949, the full-size Oldsmobile 88 was produced until 1999 and became the top-selling line for twenty-four years. Produced in Wentzville, Missouri, and both Flint and Lake Orion, Michigan, the Oldsmobile Eighty Eight was a representation of an image. Especially during the beginning three years, the Oldsmobile 88 was one of the best performing automobiles. This was most likely due to its small size, along with the lightweight and advanced over-head valve high-compression V8 engines. This engine was originally intended for the larger, more luxurious 98 series. Named to complement the already existing 76 and 98 series, the 88 which was considered to be the grandaddy of musclecars of the 1960s was first introduced in 1949, and utilized the 76's platform with a newly added large and powerful Rocket V8 engine. Popular duriing its time, the Eighty Eight inspired a popular song 'Rocket 88' and a popular 1950's slogan, 'Make a Date with a Rocket 88'. The rocket was eventually adoped as the Oldmsobile logo during the 1960's, though the 88 name continued to remain in the lineup until the late 1990's. During the 1950's several updates to the Eighty Eight included a one-piece windshield unit as the replacement of the two-piece windshield with the addition of the Holiday Hardtop to the Oldsmobile line. At the same time, a three-speed manual transmission with column shift also became available as a ‘delete for credit' option to the Hydra-Matic automatic transmission. After the 1950 model year, the six-cylinder 76 lineup was dropped entirely as the Eighty Eight now outsold the previoius line. In 1951 a more luxurious version of the basic 88, the new Super 88 model was introduced. This new model continued in production until 1964 and was replaced by the new Delta 88 for 1965. 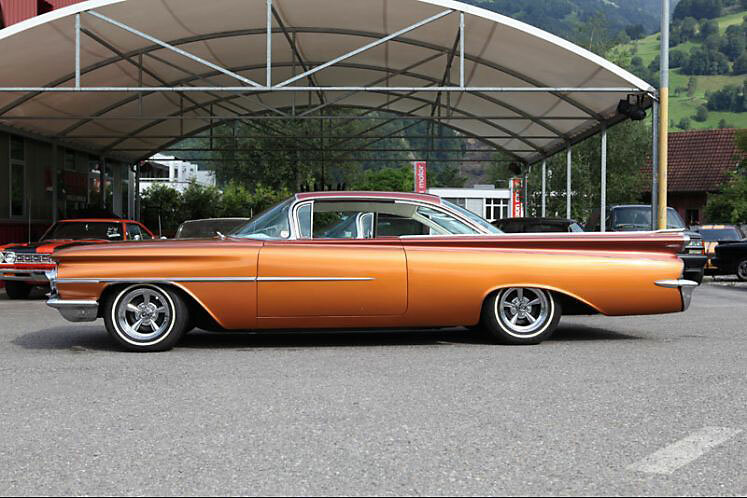 In 1958, the newest entry level model below the Super 88 was introduced, the Oldsmobile Dynamic Rocket 88 Pillarless Coupe', or the Dynamic 88. The Jetstar I was introduced in 1964. Sharing several of the mid-size car components with the F-85 line, the Jetstar 88 utilized the smaller 330 8, and the Jetaway two-speed autommatic transmission rather the Hydra-Matic found in other Oldsmobiles. The main competitor to the Pontiac Grand Prix, the Jetstar I was only produced for two years, and shared the same $3,500 price range. Though it included less standard equipment, the Jetstar I had the same notchback body style and more powerful Rocket V8 engine as the Starfire. With a concave rear window, the Jetstar I is easily distinguishable from the Jetstar 88 and the Starfire who share convex rear windows. The Oldsmobile division introduced a new Vista Cruiser wagon during 1964 that featured both skylights and a raised roofline over the rear seat and cargo area. The final year for Oldsmobile to offer full-sized station wagons for several more years, the new Vista Cruiser was really a stretched out version of the F-85/Cutlass wagons with a wheelbase that was siz-inches longer. The Vista, which offered six or nine passenger seating that all faced forward, shared the same 330 cubic-inch Jetfire Rocket V8 that was found in the mid-sized models. During the 1965 year, all Oldsmobile models featured new styling and engineering. The C-body Ninety-Eights now had more formal, square lines, while the B-body cars now featured a more rounded styling with Coke-bottle profiles, and the Holiday (two-door hardtop) coupes featured semi-fastback rooflines. During this model year, the division was concentrating on its cargo-carrying bussiness on the stretched-intermediate Vista Cruiser wagons and no station wagons were offered in the full-sized Oldsmobile lineup. An upscale trim line of the Dynamic 88, the Delta name was introduced in 1965 and replaced the previous top-series B-body Oldsmobiles, the Super 88. Originally referred to as the Dynamic 88 Deltas, the name reverted to Delta 88 within a few weeks. Marketed as a separate series by Oldsmobile, these models were known as the Delta 88. The wheelbase remained unchanged at 123 inches. In 1965 a new convertible was added to the Delta 88 line. In that same year, the new, luxurius Ninety-Eighty Luxury Sedan was introduced. Featuring an even more luxurious interier than regular Nintey-Eight models, the 98 LS's came with vinyl roofs offered only in black for the 1965 model year. The new LS's also had more standard amentities that included power windows and seats. The new Super Rocket V8 was introduced in 1965 and featured 425 cubic-inches and had a horsepower rating that ranged from 300 to 370 depending on both carburetion and compression ratio. Replacing the original Hydra-Matic transmission that had been standard to Oldmsobile since the 1940's was the new three-speed Turbo Hydra-Matic transmission with torque converter. The full-sized Oldsmobile line received few changes during the following year other than revised grilles and tail sections. Only offered as a hardtop coupe, the lower-priced Starfire was introduced while the sporty Jetstar I series was dropped. The leather seats were replaced by Moroccen vinyl, and was downgraded from standard to optional equipement was the Turbo Hydra-Matic transmission, power brakes and steering. Replacing both the Dynamic 88 and Jetstar 88, the Delmont 88 was introduced in 1967 and featured a 330 V8. Updated to the 350 V8 in 1968 as standard equipment, the 425 V8 was an option on the Delmont, and standard on both the Delta 88 and the Ninety-Eight. The Delmont 88 was only produced for two years. A new subseries of the Delta 88 was formed in 1967, the Delta Custom, which featured a more plush interior. The four-door sedan, the Holiday or the 2-door hardtop coupe Holiday came with a choice of eithe rStrato bucket seats with console or a Strato bench seat with an armrest. The successor to the former 88-based Oldsmobile Starfire series, the Delta custom Holiday Coupe had a standard Oldsmobile semi-fastback roofline instead of the Starfire's concave rear window and squared off roof. Designed to regulate carburetor air temperature, a Climate Combustion Control system and front disc brakes were added as options to the Rocket V8s. These new options would boost fuel economy, along with speed coke warm up, while it eliminated winter icing and permitted easier starting along with more efficient operation during cold weather. The 1967 full-sized Oldsmobile now featured more rounded styling cues, with longer hoods, shorter decks along with more sweeping fastback rooflines on the 88 Holiday coupes. The following year, an eventual Oldsmobile trademark was introduced in the front end split-grille design. In 1968 the Delmont 88 received a larger 350 cubic-inch V8 engine that became standard equipment. The Delmont name was dropped in 1969 and replaced with the Delta 88 which appeared as a full-line series featuring the Delta 88 Custom. The standard engine was a 350 cubic-inch Rocket V8 and the base Delta 88 came with a two-barrel carburetor that was rated at 250 horsepower. Optional on the base series was a two-barrel version of the 455 cubic-inch V8 which was rated at 310 horsepower, and standard on the Delta 88 Custom and Royale models. The four-barrel Ultra High Compression 455 cubic-inch V8 that was rated at 365 horsepower was optional, while standard on the Ninety-Eight. The 390-horsepower version of the four-barrel 455 V8 was a top option that was available in all Delta 88 models as the W-33 option. In 1969, the wheelbase was increased by one-inch to ‘124 on the Delta 88 and ‘127 on the Ninety-Eight, while all full-sized Oldsmobiles were completely restyled with more squared off rooflines and bodylines. Previously offered as an optionon the smaller engine 88 models, the two-speed Jetaway automatic was dropped completely for the three-speed Turbo Hydra-Matic transmission that was previously only offered with the larger engines. An option on the Delta 88 and standard on the Ninety-Eight was the new GM-designed Variable-Ratio Power Steering system. A slightly revised rear section and a new split grille that no longer extended to surround the headlights were the only detail changes in 1970. Both 350 and 455 cubic-inch Rocket V8's featured 'Positive Valve Rotators' to enhance the engine life and encourage more efficient operation and powertrain selections were carried over from 1969 models. A Chevrolet Caprice Clone, the 1977 Custom Cruiser wagon had a production time of two years before being discontinued in 1979. The 88 on the GM B platform now offered two body styles, the coupe and the town sedan. The Royale Brougham became the high-line model of the 88 in 1980 and continued in this status until 1983. Oldsmobiles most luxurious rear-wheel drive vehicle was the new Delta 88 Royale Broughan LS model of the 88, released after a major redesign in 1985. A Holiday model that featured a floor-mounted shifter and console between the front seats of a Delta 88 coupe was released in 1978 until 1981. The Delta 88 switched from the GM B platform to the GM H platform in 1986. The GM H was much smaller and came with only 110.8 in. wheelbase. Becoming sinply the Eighty Eight', the ‘Delta' prefix was dropped in 1989 along with the hood ornament. Redesigned again in 1992, the Eighty-Eight received a minor facelift in 1990. The last Eighty Eight or 88 model from Oldsmobile, it was finally replaced by the Aurora for 2001, a V6-powered base.